Is it Goldens Bridge or Golden's Bridge? It depends where you look. The sign in the picture says Golden's Bridge, but others said Goldens Bridge. Current schedules list it as Goldens Bridge, but earlier schedules say Golden's Bridge. 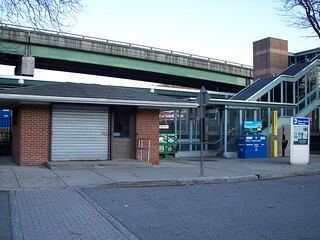 Goldens Bridge has the same kind of newer small brick station building as Purdy's, but this one appears to be closed. I'm not sure how far back this station building dates. 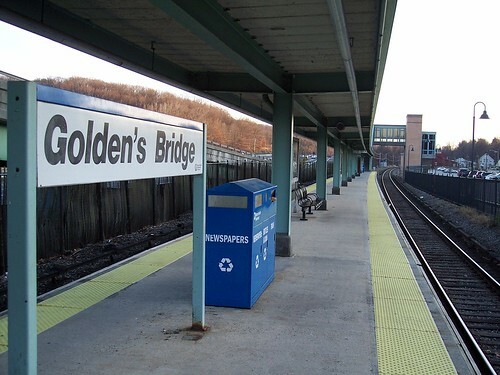 A photo of the old Goldens Bridge station can be found on the I Ride The Harlem Line blog.